Our Promotional Travel Mugs are a must have winter essential! Custom printed travel mugs are perfect for people on the go this winter. 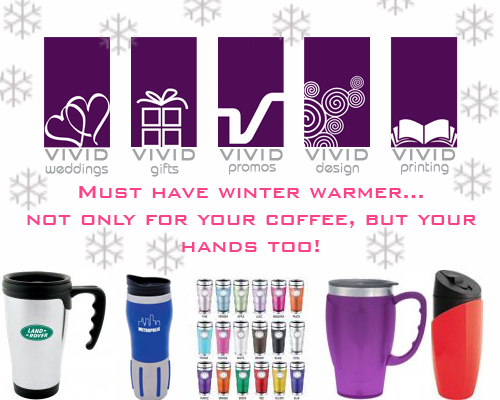 With various new sleek designs available at awesome prices, Vivid Promos is sure to have a travel Mug to suit your budget. Aluminium Travel Mugs will keep you and your morning coffee hot for hours. Check out our Stainless Steel Travel Mugs with double walled Stainless Steel thermal construction inner and stainless steel outer in various shapes and sizes. Printed Travel Mugs are a great way to show off your logo and get plenty of compliments, great value pricing on Engraved Aluminium Travel Mugs. Stainless Steel Mugs with practical handle and sipper with open and close actions, never spill your drink again! Plastic Travel Mugs are a great promo gift this winter with our huge range of bright and colourful Travel Mugs in fun or corporate designs. You can’t go past our cheap Travel Mugs made from high quality materials with over 125 different Travel Mugs to choose from, there’s sure to be one for you.